Design My Idea is a full service design studio BY inventors FOR inventors. Tips, tricks and services all updated for the resources of our inventors. The more information, the higher the rate of success for everyone! 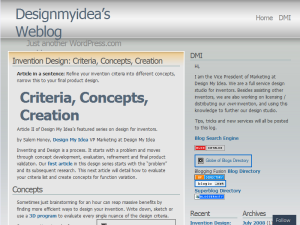 This what your Inventors Corner, Full Design Studio Blog Ad will look like to visitors! Of course you will want to use keywords and ad targeting to get the most out of your ad campaign! So purchase an ad space today before there all gone! Article in a sentence: Refine your invention criteria into different concepts, narrow this to your final product design. Article II of Design My Idea’s featured series on design for inventors. Inventing and Design is a process. It starts with a problem and moves through concept development, evaluation, refinement and final product validation. Our first article in this design series starts with the “problem” and its subsequent research. This next article will detail how to evaluate your criteria list and create concepts for function variation. Sometimes just brainstorming for an hour can reap massive benefits by finding more efficient ways to design your invention. Write down, sketch or use a 3D program to evaluate every single nuance of the design criteria. All of your concepts should retain a similar function but cover enough variation to help you reach your final product design. Cord Management – Use a soft and/or flexible material to securely hold a variety of cords and wires, using foam, rubber or bristles to do so. Usage – Must have a rigid structure capable of attaching to desk or entertainment center using adhesive, suction cup or screws. These similar, yet varied concepts obviously have different pro’s and con’s which must be evaluated before pursuing prototypes or manufacturing. Concepts allow you to brainstorm your invention’s application, streamline the design for the most effective and efficient final product and this ultimately saves you time and money. Pursuing every avenue in the beginning of the design phase prevents future problems that you neglected to consider. Next – Look for our next article on evaluating concepts to determine your final product design. Article in a sentence: Identify your invention purpose, find competition and existing products and refine your invention solution for proper invention design. Inventing, many would say, is a game of “luck” finding that one simple idea and running with it. Some inventions are proprietary knowledge, such as intellectual property allowing you to build a software empire, or holding the patent rights on a new type of industrial machine, but many successful inventions are created primarily by improving existing products. With such a large global marketplace, many researched and produced consumer goods are already available to satisfy the basic function of the product. However, this does not mean that it cannot be improved and create even more benefits to consumers beyond its basic function. Where do you start? Many resources are available to the first time inventor (including Idea Tango), giving detailed step-by-step instructions, but we want to instead focus on your invention’s actual product design. This is done by research: finding existing products and competitors, laying out and researching the feasibility of your product and defining your design criteria. Existing Products – It is highly important to examine products already in existence, as well as see who your competitors are and what they provide. Frequently you will be surprised that your invention has already been “thought up,” even pateneted, whether or not it has had any market success. We have also been shocked when from time to time we receive multiple design requests for the same product all within the space of a month and from different inventors. Previous and existing product research is very important, and our resources page has some starter links to get you going. Product Benefits – From here, you need to narrow down your product design to evaluate its benefits and feasibility. Take our own example of Corg, our cord management device. Corg – The idea? Cordage! Massive amounts of tangled cords piled behind desks and around corners. This is a problem within homes, offices and businesses. We wanted to find a solution to this, and our first step was to find out what existing products were available. We found them generally unsatisfactory in several aspects. Research – We found clips that snap together, zip ties which cannot be easily accessed, a few organizers which twist cords around a center piece (which is damaging to electrical signals in the long term) and the terrible “tube” designs which necessitate the user to feed every individual cable through the device, making the cords hard to reaccess. None of these existing products would suit the purpose we had in mind to effectively and simply manage cords. Design Criteria – We have envisioned redesigning a cord management device, we know many of our current competitor’s products: their benfits, and prices, and now we can define what we want our own invention idea to include. We wanted all of these criteria points to be included in Corg’s final product design. This would help set our invention apart from the competition. Next – Look soon for a new article detailing how to weigh the feasibility of your design criteria, compare this to your competition and push your product design to the next level. Hi fellow inventors, we are being featured on Idea Tango, a great web 2.0 community for inventors, specifically for our Product Design service expertise. We are going to be doing at least an eight article series specifically for Invention Product Design. Prototyping: Physical: Different types, what you need, etc. I am excited for this series, as so many of our clients start out very “green” with little knowledge of just how much is required for inventing, but, it is not daunting, it just requires time and effort. A little bit of knowhow, will also help you go a long way. Inventors: “Everyone” is not your target market. Article in a sentence: Research & define your market relative to your invention for optimal sales. Inventing, manufacturing or licensing marketing a product is like starting a small business. Besides financial needs, projections, costs, distribution factors and the like, many inventors seem to lack knowledge of their market. Just as any business, failure rates for inventing are in the high ninety-percentile and you can mitigate certain risks by using free information to help guide you through the process. Within this article, I will try to tackle an introduction to narrowing your target market to sell to specific demographics. “Many times when I ask “who is your target market?” they will throw their arms real wide exclaiming “Well EVERYONE!” But this just is not smart business.” This is a quote from Rudy Ortiz of the Small Business Development Center in Sandy,Utah, which is a non-profit organization which assists with startup help for small businesses. Rudy and myself were having a conversation concerning targeting demographics and marketing strategies. What he means, and what many business professionals know, is that even if your product has a broad appeal to many different market groups, you cannot design a singular logo, branding scheme and advertising campaign for all of these different segments. Targeting “everyone” is a great way to include “no one” and alienating “most.” Everyone is NOT your target market. When thinking about your product branding and advertising, you must keep in mind your goal. This is to convey the products function, meaning and benefits to your target consumer and affect a sale. Your target customer can be a full range of different backgrounds and income levels, but to garner the most sales you need to be able to target your “core” segment. By “core” I mean those who will give your product the most exposure, purchase the most of your product and become loyal longtime customers. Take an example with Apples highly successful iPod. The iPod has a very broad appeal to many age groups and demographics, but does not design its ad campaigns around all the potential markets, but rather chose a specific “young” or “hip” demographic for its early campaign. You may recall the original TV and web ads which featured dancing silhouettes. This ad, with the original price tag of nearly $500, was definitely “business person” oriented. As pricing came down, ad’s changed to run a larger gamut of demographics. And yet, even with all the new iPhone ads which are more “down to earth” and “understanding” to a younger generation, the demographics remain nearly the same as they convey the same benefits of the iPhone. Think about the differences, and the similarities of the iPhone ads, and why the core clientele has not shifted thus far. If you believe your product has a broad range of customer potential something, that can be helpful is thinking about the intentions your customers would have by purchasing your item. What are the benefits of your product which is appealing to this broad swath of customers? Narrow this by targeting your core audience with a marketing campaign for the core segment. Many free resources are available online for examining different demographic data, and some are included at the end of this article. With your marketing campaign, always keep in mind your “core” group of customers. Even if your product appeals to several markets, each market should have a different ad campaign and this can be very taxing, time and money wise, on the first time inventor. Do your due diligence in market research, narrow your marketing campaign to your “core” customers, monitor its progress, adjust and repeat all over again. Our own client Tina Pantoja is the inventor and owner of MuVi Seat Holster. Tina came to Design My Idea with a finished product and a manufacturer already lined up. With some small tweaks for manufacturing to the CAD files, we then designed the packaging and logo scheme below. Tina’s target market for her product is iPhone and comparable smart phone buyers; mainly business professionals who travel intensively. These customers already have invested an above average amount of money into a media-phone combination device, and so enjoy the “latest and greatest” technology. Given this information, our packaging design and logo take into account the sleekness of an iPhone-type device, very quickly relate the function and benefits of the product, and showcase the product in action. It is meant to first catch your eye, quickly demonstrate the product, showcase the benefits, and facilitate a sale. A download is available of an example from the Small Business Development Center, while Design My Idea was looking at marketing an online Performance Assessment tool to small and medium businesses. Article in a sentence: Understanding the customer’s needs are key to any product development. If you have a web browser, you can have a prototype – a virtual one, that is. Design My Idea LLC has developed VirtuType, a Web-based computer-aided design (CAD) product. Post a virtual prototype on your web site, and potentioal investors and customers can zoom, spin and virtually try your product – even change its colos. We invited Brian Gates, the company’s president and lead designer, to this month’s session of TalkBack. While a picture may be worth a 1,000 words, it would seem having a physical prototype in hand would be even better. What are the advantages of a virtual prototype over the real deal? A virtual prototype allows an inventor to share unlimited samples of their product across the world instantly for very little investment. Users can examine parts, change accessories and simulate device functions. And you can modify colors or materials and ensure you have the most recent design at your fingertips. This technology delivers instant gratification. Talk about the suite of services you offer and how you differentiate your operation from the competition. Design My Idea offers inventors a single solution for designing, developing and marketing their invention. We offer a complete range of design services including industrial design, 3D modeling, packaging, product branding, web development and everything in-between. Our goal is to simplify the design process for inventors while enabling them to achieve superior quality design by bringing all these services into one company. Design My Idea operates on a National level by utilizing the internet to interact with our clients and our company’s success is based solely on the response received by our boss, the inventor. Talk about how increases in computational power and Internet bandwidth affected your business. The “new” internet has really enabled us to expand our business into every home. We have worked with stay-at-home parents thousands of miles away and individuals living in remote areas to develop their idea without ever meeting face to face. Inventors are able to instantly review their designs and offer feedback while being able to share their assets with friends and family at a moment’s notice. Just as we have seen the continual increase in online shopping for products, I suspect we will see the same for innovative product development through the web. How can you reassure inventors and independent product developers that their ideas are safe with you? Design My Idea treats every idea with the utmost consideration for confidentiality. We accept inventor provided non-disclosure agreements or offer a standard NDA to all potential clients. Submitted concepts are only reviewed by necessary personnel and the information is destroyed or returned should the client pursue another direction for their development. Inventors control user rights to all design materials through a private project portal. Who are some of your clients and what did you do for them? Our clients range from first-time inventors to corporations seeking help in various phases of product development. Plane Clean Air came to us two years ago seeking packaging designs and branding for their new product. We developed various styles of packaging, complete product branding, trade-show material and a video for an infomercial. With our help, they have landed their product in hundreds of travel boutiques worldwide and on target.com. MBL of America, an ultra high-end audio equipment manufacturer, came to us seeking the development of an advertising campaign for their products. Hexi-Deck was the first-time invention for a newly retired engineer, seeking to develop his new invention as a legacy for his family. We refined his design concept, created 3-D models for marketing purposes and developed the brand around the product. He is currently in talks with a major hardware manufacturer to license this product. Tell us about your plans for the coming year. Design My Idea in partnership with Patent Law & Venture Group will be releasing the world’s first and only Intellectual Property marketplace designed to allow Patent, Trademark and Copyright holders to post, bid and sell their IP through the World Wide Web. This unique service will allow for the free posting and searching of IP content while simplifying the negotiation process between IP holders and corporations. Visit http://www.MyIPdeal.com for more information on how to easily leverage your IP. Article in a sentence: Industrial Designers offer the ability to improve your inventions usability, aesthetics and ergonomics, increasing your inventions perceived value and potential. We have all seen excellent examples of industrial design mastery such as the iPod or Wii where the products design, function and form all play together beautifully. Yet how does an inventor achieve the same level of dynamics in their own invention? The solution is to work with an industrial designer to fully develop your idea. To get a better understanding of what industrial design is, let’s look at the three main traits of a well-designed product. Industrial designers are trained to recognize how different shapes and sizes play with a user. In order to illustrate this point and others let’s look at the following examples of a TV remote control design. The remotes pictured on the right show two completely different designs. The first design (Example A) is very blocky and uninteresting. The edges of the product are sharp and would feel very uncomfortable in the user’s hand. Example B has flowing organic curves that mimic the user’s hand. These traits improve the ergonomics of the device and the comfort experienced by the user while using the product. Based purely on the form of the invention the second image may have broader appeal and will stand out compared to the first image. This difference increases the perceived value of the product and thus creates a greater desire for the consumer to purchase this product over the latter. Usability is a relatively new term but the concept has been around forever and is the reason why a lot of inventors are here and are successful. The majority of inventions are improvements on current products based on the usability of the device. For this reason a lot of industrial designers focus on how the person experiences the product. Industrial designers have the schooling and ability to get inside the consumers world and project how the product may be used. By doing this they are able to adjust, foresee or even develop completely new solutions to an invention, improving the products ease of use. To continue our remote design example let’s look at the button layout. Example A has all the buttons arrange in rows with no real reason for the arrangement of the buttons. Example B on the other hand users color coding and key groupings to allow the user to quickly find the necessary keys. Additionally, the shape of the remote allows for a “natural” position for the users hand that places them on the more commonly used keys. Furthermore, the keys are arranged in a hierarchy of most used functions to least used at the bottom of the remote to further aid in the user experience. Material selection in your invention can make a world of difference in not only the cost but the overall success of the product. Industrial Designers have a broad understanding of the types of materials available to inventors and how those materials work with each other. They are able to correctly specify the materials and colors so the product is attractive and user friendly while being cost effective. Example A has a black body made completely out of plastic with a black silicon key pad. There is little contrast between the body and the keys making the remote boring and unintuitive. Example B has a plastic body with a rubberized coating along the bottom for added grip. The top has an attractively painted plastic body with a silicon keypad. Special keys contain an epoxy coating which further highlights the keys and improves the appearance of the remote. As more and more inventors race to get their ideas to market it is extremely important that the expertise offered by a competent Industrial designer not be overlooked. The designer’s ability to understand the end user, materials, ergonomics and appearance of the product can greatly improve the potential success of the invention. Design My Idea provides you with the ability to work hand in hand with an industrial designer to take your invention to the next level at inventor friendly prices. If you are the owner of Inventors Corner, Full Design Studio, or someone who enjoys this blog why not upgrade it to a Featured Listing or Permanent Listing?